As long as Joseph lived, and for some time after, the people of Israel were treated kindly by the Egyptians, out of their love for Joseph, who had saved Egypt from suffering by famine. 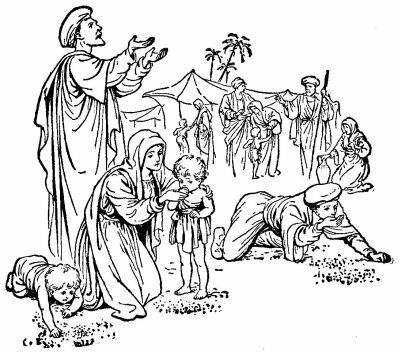 But after a long time another king began to rule over Egypt, who cared nothing for Joseph or Joseph’s people. He saw that the Israelites (as the children of Israel were called) were very many, and he feared that they would soon become greater in number and in power than the Egyptians. She made a little box like a boat and covered it with something that would not let the water into it. Such a boat as this covered over was called “an ark.” She knew that at certain times the daughter of king Pharaohall the kings of Egypt were called Pharaoh, for Pharaoh means a kingwould come down to the river for a bath. 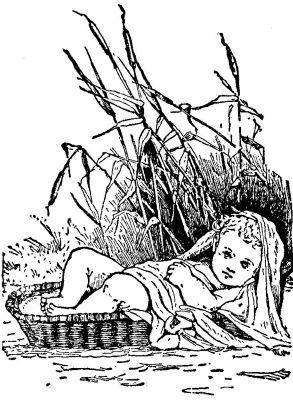 She placed her baby boy in the ark, and let it float down the river where the princess, Pharaoh’s daughter, would see it. And she sent her own daughter, a little girl named Miriam, twelve years old, to watch close at hand. How anxious the mother and the sister were as they saw the little ark floating away from them on the river! Pharaoh’s daughter, with her maids, came down to the river, and they saw the ark floating on the water, among the reeds. She sent one of her maids to bring it to her so that she might see what was in the curious box. They opened it, and there was a beautiful little baby, who began to cry to be taken up. 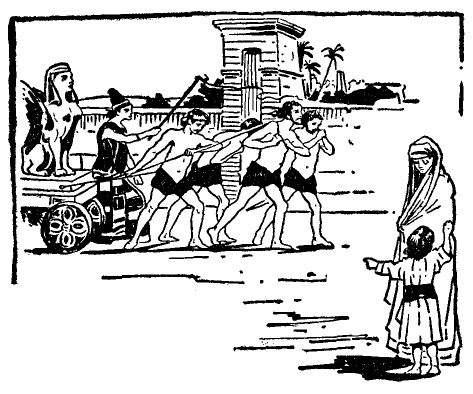 When the child was large enough to leave his mother Pharaoh’s daughter took him into her own house in the palace. She named him “Moses,” a word that means “drawn out,” because he was drawn out of the water. 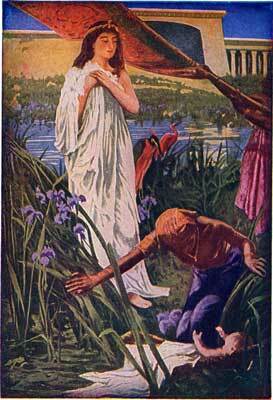 So Moses, the Hebrew boy, lived in the palace among the nobles of the land, as the son of the princess. There he learned much more than he could have learned among his own people; for there were very wise teachers. Moses gained all the knowledge that the Egyptians had to give. There in the court of the cruel king who had made slaves of the Israelites, God’s people, was growing up our Israelite boy who should at some time set his people free! These young women were sisters, the daughters of a man named Jethro, who was a priest in the land of Midian. He asked Moses to live with him, and to help him in the care of his flocks. Moses stayed with Jethro and married one of his daughters. 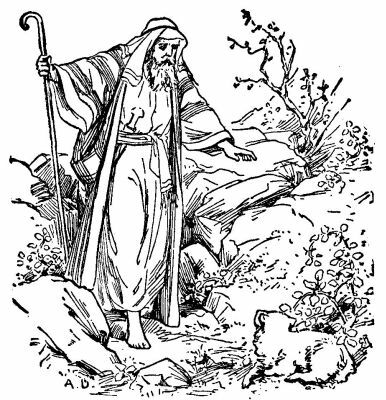 So from being a prince in the king’s palace in Egypt, Moses became a shepherd in the wilderness of Midian.